I’m learning more and more lately that the key to making a truly excellent dish is having a perfect trifecta of salty, spicy, sweet. One of my favorite cuisines, Thai – Is an excellent example of that. Many of those dishes use fish sauce as the salty, thai chili peppers as the spicy, and a bit of brown sugar as the sweetener – i.e. this Thai Beef Salad. I’m also learning that Mexican food benefits from this same trio of flavors. Take this Picadillo for instance – It combines green olives for the salty, cayenne for the spicy, and golden raisins for the little bit of sweetness. 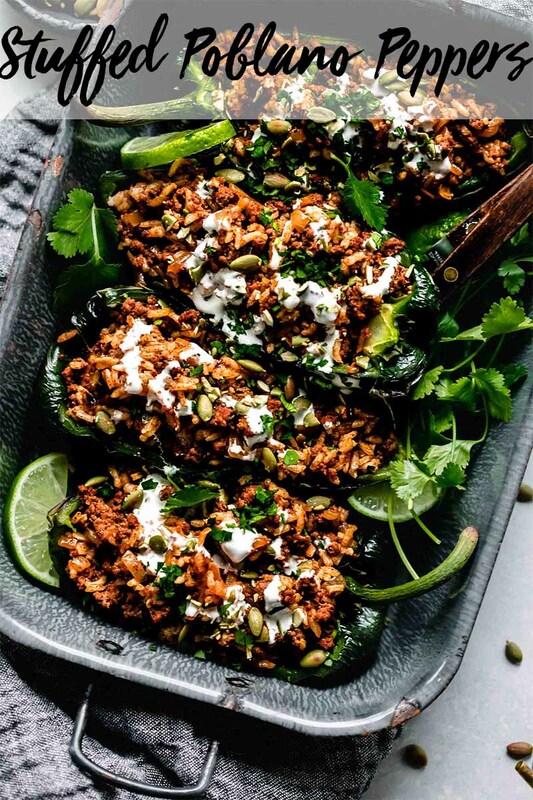 These stuffed poblano peppers are putting that same methodology to use – Salty pepitas (pumpkin seeds) combine with the spicy poblanos and a little bit of sweetness is added from the dried currants which are flecked throughout the ground beef & rice filling. Plus, we’re adding one more flavor into the mix – tangy – coming from the lime crema. 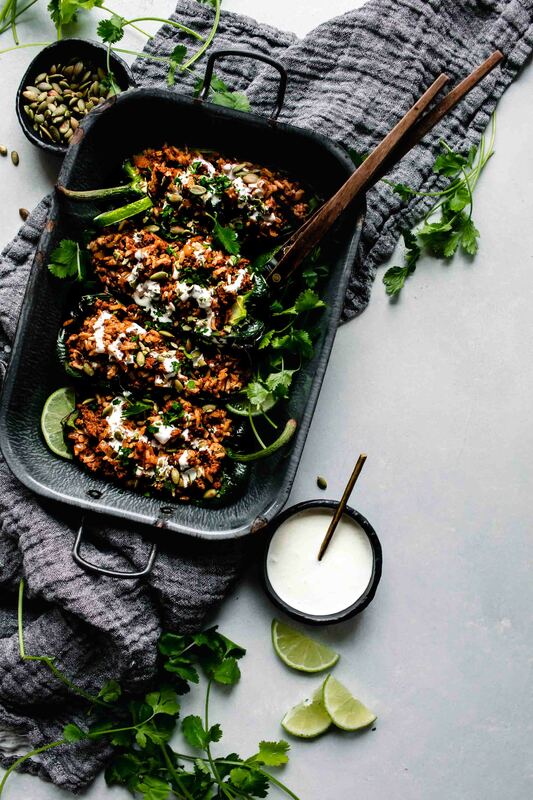 The lime crema that’s drizzled over these beef stuffed poblano peppers really takes this dish over the top, and it couldn’t be simpler to make. You only need three ingredients. Simply combine 1/2 cup mexican crema (or sour cream) with the juice of one lime and 1/4 cup chopped cilantro. 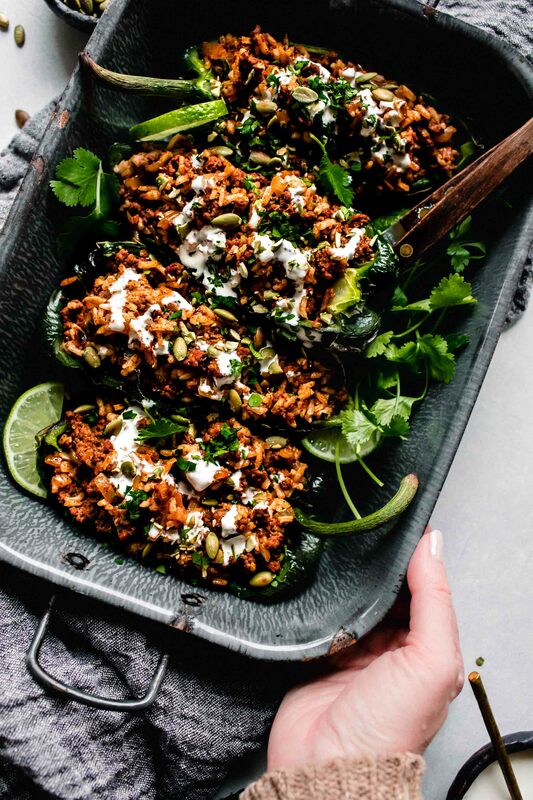 This Stuffed Poblano Peppers recipe serves four, so in our family of two, we’ll typically have leftovers the next day. But the awesome part is that these stuffed peppers are amazing leftover. You can reheat them in the microwave or in a 350-degree oven for about 30 minutes. PS – If you have an Instant Pot, have you tried making rice in it? 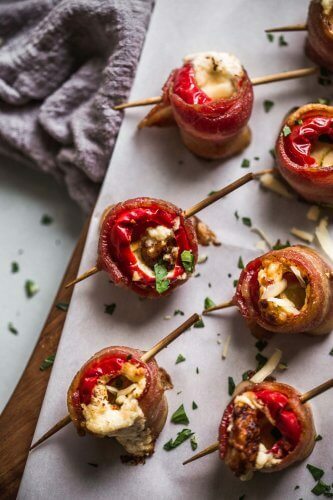 It makes things quick and easy and hands free while you prepare the rest of the ingredients for these stuffed peppers. Can You Freeze Stuffed Poblano Peppers? 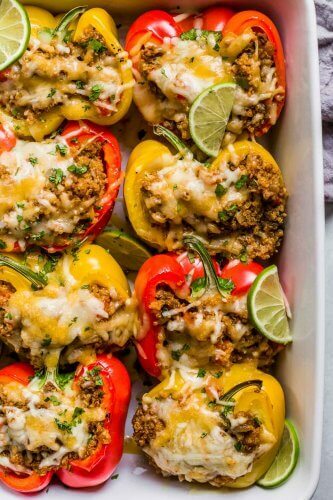 These stuffed peppers will last in the freezer for up to six months. Simply stuff the peppers and wrap them tightly with plastic wrap. When you’re ready to eat them, thaw them in a baking dish in the refrigerator overnight. Once thawed, bake in a 350-degree oven for 30-40 minutes, until heated through. In a small pot, combine the rice, 1 cup of water and a big pinch of salt. Bring to a boil then cover and reduce the heat to low. Simmer 15 minutes. Remove from heat and fluff with a fork. Set aside. Place poblano peppers on a sheet pan. Roast in the oven for 10-15 minutes, or until the skin is browned and blistered. Remove from the oven and set aside to cool, leaving the oven on. When cool enough to handle, make a lengthwise slit in each pepper and remove and discard the ribs and seeds. While the peppers cool, in a large skillet, heat oil on medium-high until hot. Add garlic and onion. Cook, stirring frequently, 2-3 minutes, until softened. Stir in the tomato paste and cumin. Cook, 2-3 minutes. Add ground beef. Cook, breaking the meat apart with a spoon, until cooked through. Stir in the currants, pepitas and cooked rice; season with salt and pepper, to taste. Stuff each pepper with the filling. Bake 4 to 6 minutes, or until heated through. Remove from the oven. While the peppers bake, in a small bowl, combine Mexican crema, lime juice, half the cilantro and 1 tablespoon of water. Season with salt and pepper to taste. 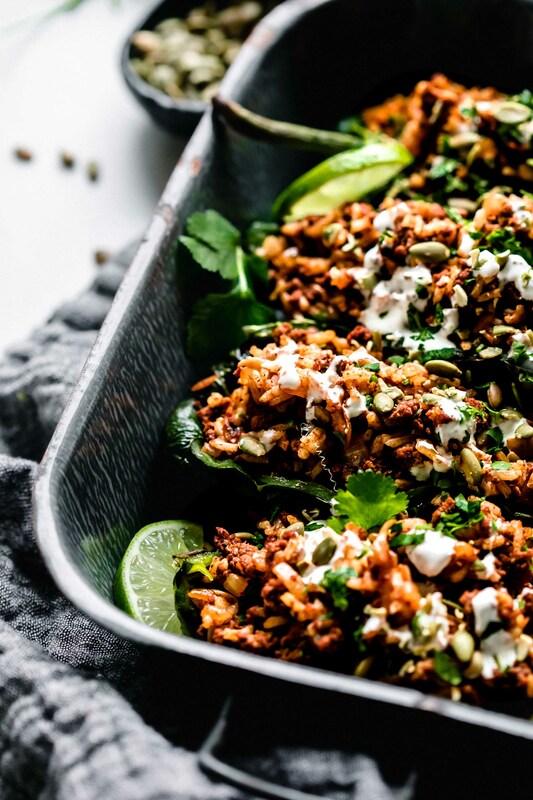 Drizzle the peppers with lime crema and sprinkle with remaining cilantro. Enjoy. 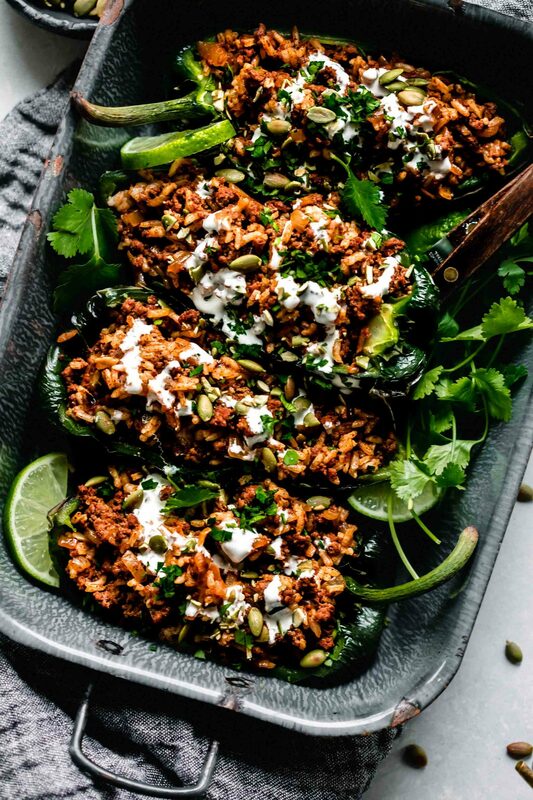 If you loved this Stuffed Poblano Peppers recipe I would appreciate it so much if you would give it a star review! Also, be sure to snap a picture of your finished dish and share it with me on Instagram using the hashtag #platingsandpairings and tagging me @platingsandpairings. This recipe was originally published in October 2015. It was updated in April 2019 to add new photographs and update the content. The original recipe remains the same. Enjoy! Zinfandel, Malbec and Merlot – Red wines with a hint of sweetness to them tend to pair well with this hearty, spice-forward dish. Thanks Susan – I really am learning more and more that you need that perfect combination of flavors that just ends up kind of singing together in good harmony! I wonder if my (vegan) (mexican) friend could alter this. Loos really good, and I bet she knows some tricks. I’m sure you could definitely alter this dish to be vegan – Let me know if your friend tries it. I’d love to hear back Cyra! Thank you Marlynn – The Crios Malbec was definitely a great pairing for the spices found in the stuffed poblanos! I’m not usually a big fan of spicy, but wow that looks yummy! They’re really not all that spicy Ali – As long as you get all the seeds and ribs out of the roasted poblanos, they’re actually quite mild! Looks delicious!! I think even I could handle the heat of these.. I am not always good with spice. Thanks Natasha! The poblanos are not too spicy, just be sure that you remove all those seeds and ribs. I have always had a huge love of Mexican food and no Mexican meal would be complete without some form of chilies. 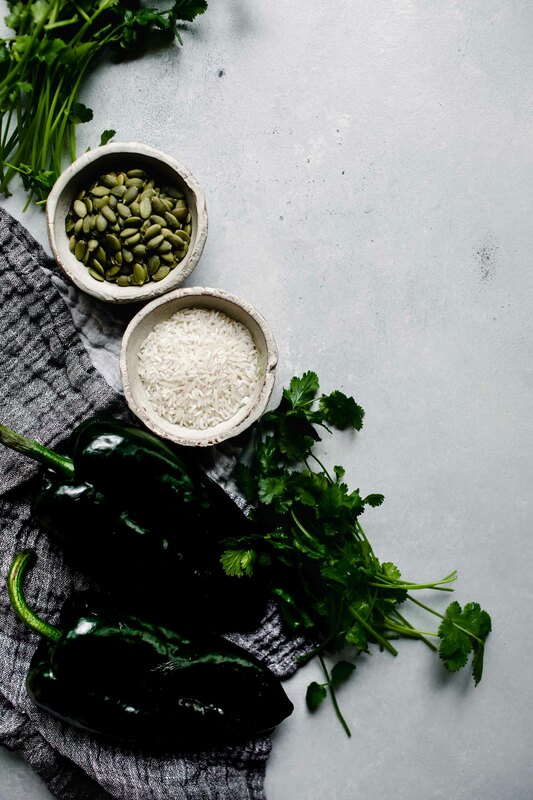 Poblano are one of the most popular of the chilies used in Mexican cooking and I am all there with you on this recipe. I think one thing I might differ with your recipe is adding some Queso Blanco to the top as to me this dish just screams for cheese. I will definitely be adding this to my to try list. The lime crema is a wonderful topping it gives that nice cooling and refreshing flavor to the bite of the peppers. Hover your mouse here to see the data that CommentLuv got back from your site..
Hi Christine! You are right! Cheese would be amazing melted on top of these as well! You can never have too much cheese, right?! I hope you love them Quin!